On the day the jury went to Walgreens—to see the crime scene all mapped out—they first allowed us, as victims, time to walk through with the detectives and ask questions. I remember getting out of my car—shaking I was so nervous—wanting to burst into tears. It was daytime, but the chill in the October air was not much different than it would have been that cold March night. There was tape blocking off the parking lot. That sight alone sent chills down my spine. There were markers for everything—where the gun was found, where the cars were parked, any spot blood had fallen, where Rob was found . . . and where Emmett had died. My mind fell back to the day the kids and I had spent in the parking lot—trying to figure out where he had taken his last breath . . . now I knew. A desire I had months before all the sudden slipped away as I forced myself to learn more truths. While I walked around looking at facts and listening to evidence, my mind played the scenario over and over again—each time watching him fall to the ground where markers now showed the outline of exactly where he landed. All of the sudden I looked up and spotted a man with a camera hiding on the other side of the parking lot snapping pictures of us. I wanted to run across the stalls and punch him in the face. What on earth was he doing there? What part of this pain we were battling was worth sneaking pictures of us as we worked our way through it? I felt violated and broken. My panic and the thoughts I had been fighting all morning about facing these hard truths, soon gave way to an all-too-well-known humiliation—I had no idea where those pictures were going to end up . . . and that vulnerable feeling left me leaving that parking lot feeling even more alone than I had in the fog of darkness that had surrounded me walking the murder scene. I couldn’t even grieve and heal without someone watching? My bitterness nagged at me for the rest of the day, and soon we all found ourselves back in the courtroom. Hate festered in my heart as I stared at the back of Rob's head—this time with a perfect knowledge of exactly where and how he executed his plan. I saw him as a beast those days—a monster. Each day that passed, my desire to find forgiveness gave way to my need for justice to be served. I don’t remember who the teacher was—or anything else said that day—but I will never forget that question. Mercy. Justice. What were those two to look like standing side by side? How could they—if possible—be used together? I spent a lot of that afternoon challenging my belief of their definition and how to apply them to myself. What was justice supposed to look like if I was viewing the world as Christ would? What mercy was I supposed to be seeking? A few days later the trial came to an end and we were asked to leave the courtroom so the jury could take the facts and determine a verdict. A few friends of mine had come to take me to lunch. We decided to make our way down to the just-opened café on the bottom floor of the courthouse. I was almost annoyed that after spending a month in that building today was the day they opened, but as I pushed through the doors the smell of good food replaced the annoyance of all the days before when I had to search all over downtown for my lunch. I wasn’t sure I had an appetite, but my stomach had a different opinion—I was starving. We ordered our food and made our way to the table. I threw my purse on my chair and headed over to fill up my drink. And there it was. Someone HAD thought about me. Someone really did care how all of this had felt for us. For the first time I realized that man—that pulled the trigger—was a brother. He had a mom, and a sister—and a family who loved him. Not because he was perfect, or they didn’t hear the facts of the choices he made . . . but just as I had said I would have stayed by Emmett’s side as he worked through his struggles—Rob had a family willing to do the same for him. Unconditional love is sitting through a month long murder trial on the other side of the room—the one where people stare from their seats and send hate from tear stung eyes—to someone you still have faith in. Hope . . . good enough to sit behind him and let him know that no matter what choices he made, what facts prove his mistakes . . . you still stay, because you love him. All of the sudden—realizing there was another side to that courtroom—my view of the verdict began to get foggy. Waiting for a jury to decide the fate of a man is an experience that is hard to explain. It is a nerve-racking situation full of fears, emotions, and internal battles. My heart felt torn as I watched his family and thought about the children who called him father. My twins' words echoed in my mind whenever I battled the need for revenge, “But mom . . . what about his kids? If he is in jail, then all of us lost our dads.” The empathy my children had shown that day when Rob was to go back to jail pulled at my heart and beckoned me to find forgiveness. The dance I now was swaying to, was one of the need for justice . . . and the hope to find mercy inside myself. Forgiveness didn’t seem possible if I was filled with a desire for a sentencing to put him behind bars. My mind was filled with the emotions of who I needed to be—and what I was to hope for. The clock seemed to slow down as I waited in a small room hidden away from the world. Friends would stop by and bring me snacks and a few laughs, but the pit in my stomach was not fed by anything. My eye literally started to twitch just hours after we were sent to wait for the jury—every few minutes it would start to spasm and there was no way to stop it. It felt like the outside of my body was about to have a break down—to match the inside chaos I was facing all alone. The time we would have to wait was unknown and even the days could be unnumbered—but while the jury stayed in session I wouldn’t leave the building. For almost two years I thought the pinnacle of my healing would be the day of the trial when Rob was sentenced—boy was I wrong. As I stood in that courtroom and on day two the jury finally had come to a verdict my heart dropped as it was announced. I looked around the room and it felt as though everything was in slow motion. I looked at his mother and sister and watched them as they heard the judge announce “Second Degree Murder . . . 30 years in prison”. I was filled with turmoil as my body told me to celebrate justice . . . and my heart told me to mourn with those who would now be mourning. I have never lost a child to death. I have never had to hear that my son’s actions would have him taken away from me . . . but that day my heart hurt for a group of mothers. Emmett’s mother . . . and Rob’s. One praying for justice . . . the other pleading for mercy. Why does life have to be so hard? Why can't we all just win? Why do we have to choose stupid choices and react to our fears? Why do we have to feel hate? Why do we have to choose a side? Justice and mercy. Mercy tells us we must forgive . . . whereas justice tells us those who do wrong must be accountable for their actions. Sometimes when these two collide inside us—it is hard to choose a side. Months after Rob was sentenced all victims of his crime were offered a chance to read a victim statement. Every version I wrote became part of my battle between justice and mercy. I couldn’t wait to tell him how his choices had broken my family, and I knew I would never forgive that gun . . . but I wanted to forgive him. First I talked to him directly about my battle to forgive—to forgive him—the man whose voice I had never even heard—the man who took a gun. I talked about my struggle to find forgiveness for his wife and the choices she made, and the impossible battle to find forgiveness for a husband I would never see again. I held up a picture, one I had taken in the weeks before Emmett died. It was a picture of all five of our kids—Tytus was just a few weeks old. They looked so adorable and their smiles were like beams of sunshine. As I held it up, tears began to fall from my cheeks. I said, “I have had the pleasure of taking care of a few “victims” that couldn’t be here today—except they aren’t just “victims” . 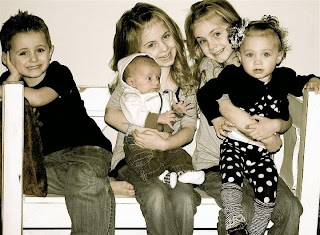 . . they are five of the most amazing children I could have ever asked for. They have been my strength and I wanted their voices to be heard today. Then I played a video statement from each of my kids. (I had shared with them a few days before, in a family home evening lesson about forgiveness, what I was preparing to do that week. They asked if they could come with me and tell Rob how he hurt them, so instead I let them do a video of their statements.) My twins each talked about how much his choice had hurt them and their family. Teage just cried uncontrollably and said, “I don’t want to talk to Rob, I don’t ever even want to hear his name ever again.” Kaleeya talked about her Doggy Doggy and how Daddy Emmett gave it to her and she takes it everywhere with her, “In spring, and spring, and summer and summer and everywhere!” Then I showed a video of the first time Tytus danced. At first he started out really slowly and uneasy, and by the end he was laughing and smiling and shaking his whole body. Then I got the chance I had been waiting for. I got to read the statement I had been writing in my head every day for two years. I had gone over it again and again any time I was alone in the car. Its words built up inside of me every time I sat outside my son’s door at night listening to his sobs, or mornings when I had to force myself out of bed. My name is Ashlee. In March 2011 I was married to a man named Emmett Corrigan. We had just celebrated our 7th anniversary. We were married in Lehi, Utah on March 6th, 2004. Together we had five children: twin girls named Bostyn and Bailey who were almost six, a four year old son named Teage, a twenty month old daughter named Kaleeya, and a six week old son named Tytus. We spent years together creating this family. A few of those years we were both going to Utah State University for our undergrad degrees. Next came 3 long years of Law school in Spokane Washington. At the finish of law school, we had just had baby number 4, and decided to settle in Meridian, Idaho. The opportunity to work with Jake Petersen Law helped to finalize that decision. Emmett had been in practice with Jake since the very end of law school up until the day he died. He had made a great name for himself in that firm and also with his own criminal law practice and was very excited about finally being out of school and providing for our family. The events that took place on March 11, 2011—that ended Emmett’s life—shattered my family. The night itself was a traumatic event for each of us, and the year and nine months that have followed have brought much heartache and pain. The decisions made that night that resulted in Emmett being shot in the heart and in the head didn’t just end an affair and a life—it ended a family. That gun that was placed in his pocket and driven to that Walgreens shot two bullets at a man who was a father. It ended a family. He was a husband. He was my husband and he was my babies’ father. He wasn’t always a perfect husband, and just like the rest of us…sometimes he wasn’t a perfect father; but he was OURS. He was the man who was greeted every night by 10 tiny hands held out waiting for their welcome home hugs. He was the man that sang ‘Take me out to the ball game’ before bed to his son. He was the leader of our home. He was his little girls’ protector and his sons’ super hero. I could write about Teage’s tears shed in a bathroom where a young boy cried while his class performed for their Moms and Dads celebrating their preschool graduation….sobbing and shaking because he was the only one who didn’t have a Dad. He never said one word or sang one note…just sat in a bathroom crying. I could talk about the thousands and thousands of dollars and time we have spent at therapist and grief counseling groups. I could talk about Kaleeya and her doggy doggy that Emmett gave her a few weeks before he died. A doggie that now looks like a pile of rags because she won’t spend a minute away from him—one of the only lasting memories she has of her father. I could type about days where we didn’t leave our house because every time we did fireworks would go off and my kids would almost stop breathing in panic attacks thinking that they heard the gun. Every time an ambulance passes by our house the whole house freezes. They have endless questions about policemen and why they didn’t do their job…if they have guns to protect people, “Why didn’t they protect my DAD!” Twin kindergarteners finally decide to go back to school after their Dad’s murder, and I get a call from the school counselor saying my innocent daughters are sitting in her office with broken hearts because some of the boys in their class thought it was cool their Daddy got shot. Weeks later neighbor boys are playing cops and robbers in their front yard and my kids are running inside screaming about a gun that once—as my daughter Bostyn has described it many times—“stopped their world”. Nightmares. Endless nightmares. Sometimes even during the day they are afraid to go to sleep that night for fear another nightmare will haunt their dreams. No day has brought my kids back to the normal carefree childhood days before March 11, 2011. At least once every day, even still, something reminds one of them of that night. They are reminded that their Dad died lying on the cold concrete of a parking lot. Scared to be alone—but also scared to go to a friend’s or into public. Fear and pain that most kids have never even seen yet on a movie screen. Fear of “the bad guy”, fear of reality, anger at a man they never met nor will they ever see. I teach them of forgiveness, hope, and faith in their future, but that doesn’t bring back the man who should be sitting by my side and helping his babies through their lives. Years of missed laughs. Millions of missed memories. He didn’t see Tytus take his first bite of real food and make that sour face—or dance his first dance. He didn’t get to see him take his first steps or laugh his first laugh. Five missed graduations and five missed weddings. He won’t be there to walk Kaleeya down the aisle. He will miss the first day of college for Teage. He won’t get to sit on the couch with Bostyn and Bailey some day and talk about their first kisses. He will miss it all. When I pictured the life I always wanted to give my children I never pictured spending hours every week in a counselor’s office listening to them try to put together the pieces that were left of their life. I never pictured sitting them all down and telling them of a decision made by the man that ended the life of their hero. When I brought these babies into the world I always pictured that I would be able to protect them and keep them safe at all costs. I always thought that we would live a life of peace and they would never feel the sting that death brings at such a young age in such a horrific way. I certainly never thought I would be teaching my babies what murder is before they knew how to spell it. The death of Emmett by an angry gunman has taught me that I have no control over the choices others make. It has caused me many days of anxiety and fear. I thought my life in many ways was close to perfect…. But now it was shattered. My marriage was ended by a series of bullets as I was sitting at home reading marriage help books and rocking my screaming infant who could feel the same panic I felt that dark night. Little did I know in just a few short hours I wouldn’t even have a marriage to help. A marriage that I had worked so hard on and was willing to work on even more was taken from me. I will never get to sit across a courtroom, as I watched the others involved do, and hear, “I am sorrys and I still love you!”. I will never get to see his face one last time and get answers to the questions that now haunt my dreams. I was robbed of the man whom I had devoted my life to. He was taken from me at the age of 30. At the age of 28, I was left with a widow with a shattered heart, reality of the fears I had been seeking answers to, and five babies to raise without their father. Sitting in that room with the detectives that night, in many ways is a blur. I can remember feeling like I was not able to breathe. I can remember my heart racing and scared to death to sit my babies down the next day and tell them what happened. A part of me just wanted to pretend he got in a car wreck and turn it into a more simple conversation for my babies…but that was not our reality. Our reality was plain and simple. Our family would never be the same, and has never felt the same from that very moment. Our reality was this….Emmett didn’t die because he over corrected his car or because he forgot to stop at a stop light. Emmett didn’t even die because of an affair. Emmett died because of a gun, an angry gunman and an unforgiving shot to his head and his chest. I wish as the gunman was reminding Emmett of the five kids he had left at home, he himself would have thought about those same five kids as he aimed to pull the trigger. That decision and that gun have forever changed my children and me. I don’t feel like I will ever be whole again. We have picked up the pieces of life and tried to move forward—that is all we had left to do—but there is a void in our lives and in our hearts that will never be replaced. We will try to patch it as the years roll on but it will never be whole. Like a soldier who loses an eye in combat, we may be able to live and carry on…but it has and will continue to be a hard spot in our lives and in all that we do. For me, reading those words was so healing. It was a release of so much pain. I got to let those words go that day! It was a moment for which I had been waiting for so long. It was one of the many giant steps that I had to take, another check off my list on my road to recovery—on my path to find the purpose of living. I will never know for sure how those words affected anyone in that room—and frankly . . . I was finally to a point that it didn’t matter. I wasn’t reading them in a plea for justice, but a hope that I could find peace as I set them free. Maybe justice was served when a jury sentenced Rob with second-degree murder and put him behind bars. Maybe that was supposed to heal parts of the broken pieces inside of me—it didn’t. But what it did do was remind me of the mercy Christ has for all of us. He is that sister—that mother—that literal Brother sitting behind us, even when all the facts point to our sentence. He is there. He is always going to have our back . . . even when we don’t always feel we deserve it. His mercy . . . His grace makes it possible for Him to unconditionally sit on the forbidden side of our courtroom just to show us He still cares. His grace not only can—but will—heal those broken parts of us that don’t get put together in the ways we think they will after a month long murder trial waiting for the justice of the world to make us feel complete. His grace will be the mercy that helps us forgive—to move forward—even when we think all we have left to do is fall. His grace is enough for you. His grace is enough . . . for us all. Sometimes we may have to choose a side—but He will never leave us alone. Some days we may sit in a courtroom all by ourselves, or in an isolated room waiting for a jury to decide the fate of a man who has wronged us . . . but I can promise you one thing—there is a side we must choose. Because if we don’t . . . we will fall. The line between the darkness of this world—and His light—grows even more clear as we understand that mercy is what heals our wounds—love and hope for a greater plan. Justice may bring an earthly calm, but it is mercy that will bring peace that can last forever. For all the things we do not know . . . we will be blessed to one day understand. I am starting to have faith in this truth. I don’t understand all of the hard things that we face in our lives, but I do comprehend that these struggles will strengthen us to be stronger than we ever knew. We cannot choose what happens to us, but we can decide where it leads us. I would have never chosen the side I have had to sit on—the victim’s row. I have spent many days paralyzed in a world of unknowns. The unseen fear that has racked my soul has sometimes been more than I can bear. The battles of darkness that have surrounded my young family have been wars I never knew we would have to face, but we never faced them alone. We are strong. We are still standing. Last week at our conference A Reason To Stand, as I sat and listened to many stories much different than mine—I realized something about the human race. We get to choose a side. We get to choose if we will stand. Life is going to continually give us reasons to find excuses on why it is easier to fall. We will constantly be at a crossroad and have to decide which side we will choose. Standing is personal choice we make each day regardless of where we are. Some of the strongest people I have met—the ones who stand the tallest—are quadriplegics who will spend their life in a wheelchair. Life isn’t about how tall we measure up—it is about how strong we can become when all we are surrounded by is ugly and dark. The dark days are going to come. The one thing we know for sure is that we control nothing. We will hurt and we will lose. We can wait around for justice to bring us a false sense of our own power—a patch job for our pain—or we can begin to understand that mercy is what will make us whole. Just like with Rob’s sister at that café all those years ago . . . I don’t know how this all works, I don’t know if we are allowed to help each other through the hard days when we are forced to choose a side . . . but I hope someday we all understand the power of healing what is really broken. For all of you who have ever waited around for justice to set you free . . . stop. The answer to mercy may not change the outcome of what justice will bring, but inside our hearts we can use mercy to find a way to remember that we are all children of God. We have a Heavenly Father who loves us all . . . no matter what side of the courtroom we are sitting on. He will always have our back. And that is the unspoken truth—We are, and always were, enough for Him no matter where we stand. I am so grateful that justice and mercy are able to co-exist. It doesn't seem logical, and I'm sure glad I'm not the one who has to figure out how to balance the two, but I'm so glad they both happen. Sometimes I need justice, sometimes I need mercy, and sometimes I have no idea what part I need, but that I just need healing. It's an incredible, albeit sometimes messy, process. This is so powerful. Thank you! Very powerful! Thank you for sharing. You know Ashlee as I have followed your story, you have repeatedly mentioned how you have fought to overcome the feeling that you ‘were not enough’ for Emmett. I have sensed that this has been one of the biggest obstacles you have struggled to move beyond. As I listened today to the Dr Phil show, it clearly occurred to me that the foundational crack was and never can be you at all. The foundational crack, was and is -- that God was not enough to Emmett. God did not mean enough to Emmett for him to keep the covenants he had entered into with you (and with those five beautiful children) -- the very covenants he had made before God in a sacred house of the Lord. God was not enough to Emmett. In reality, Ashlee, it is/was about his relationship with God. God did not mean enough to Emmett for him to keep the covenants he had entered into with you (and with those five beautiful children) -- covenants he had made before God in a sacred house of the Lord. God was not enough to Emmett.